You’ve put a lot of work into making your blog awesome. Now it’s time to make it profitable. Let me make myself clear: getting rich just from blogging is a very rare thing. Earning a portion of your income, however, is not only doable, it’s realistic! And yes, you can make your blog profitable without being sneaky, scammy, or scummy about it. I make hundreds of dollars a month blogging, while giving away most of my writing for free. Some people don’t even realize that Otaku Journalist generates income! 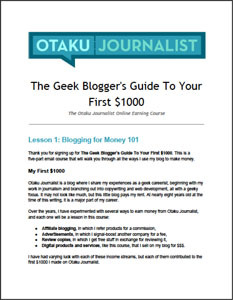 I created the Geek Blogger’s Guide to Your First $1000 because I know this is something a lot of bloggers struggle with. It’s a struggle between income generation and keeping your readers happy, but I have first-hand experience with figuring out how to find that balance.